Archbishop Pedro de la Santisima Trinidad Martinez de Arisala became Manila’s vicar in 1747. He saw the dilapidated state of the cathedral and decided to have it reconstructed by a fine architect to avoid any future defects in the edifice every time natural disasters struck the city. The archbishop requested Nueva España to send a good maestro who could handle the work and in 1748 informed the Spanish monarch that a new cathedral should replace the present one. norms of architecture. In response, a Royal Cedula was dispatched, ordering the Archbishop and the Royal Audencia to submit the design for a new cathedral church and the cost estimates for the said project. 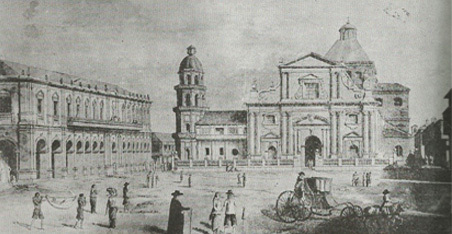 Before the Royal Cedula could reach Manila, a Florentine architect and engineer, in the person of Juan de Uguccioni, passed by Manila during the latter end of the year 1750. A missionary of the Sagrada Congregacion de Propaganda Fide, Fray Uguccioni was on his way to Goa, India, after serving the English in a technical capacity in the Malvar coast. Uguccioni proposed for a totally new edifice but budgetary considerations forced him to just restore the old structure with the introduction of the necessary modifications or renovations in conformity with aesthetics. The archbishop consulted the governor general and the Cathedral Chapter on the project. Ultimately, a consensus was reached to pursue with Uguccioni’s proposal. The Manila Cathedral underwent a major transformation under the hands of the Italian architect Juan de Uguccioni and the obrero mayor Don Estevan Roxas y Melo. Don Estevan was a native of Lima, Peru, and was secretary to Archbishop Rodriguez since 1736. After the death of the archbishop, Roxas opted to stay permanently in this colony and was appointed eventually as medio racionero and later as canonigo de gracia in the Cathedral. Because of his talent in the sciences and mathematics, as well as for efficiency in his duties, he was appointed by Archbishop Trinidad as the obrero major of the cathedral reconstruction. The Cathedral Chapter sought the permission of the governor general to start demolition work in the cathedral so that reconstruction could commence immediately, and for choir and other divine services to be held temporarily in the Church of San Andres of the College of Santa Potenciana. When cathedral services were installed in Santa Potenciana in January of 1751, demolition work on the cathedral immediately began. The reconstructed cathedral was spatially more interesting, with its basic crucifixion plan, semi-circular apse, and additional office annexed to the cathedral church. It retained its basic three-nave plan but this time, the chapels were reduced. A large chapel dedicated to St. Peter was built near the main altar while two smaller ones, dedicated to St. Joseph and Our Lady of Guadalupe were situated at the cathedral’s left side. Wrought iron grilleworks served as screens and entrances to these chapels. Winding staircases dramatically led up to the Chapter hall near the main entrance. The lead and stained glass of the cathedral were imported from Java. Marble slabs for paving the cathedral’s central nave and the front steps of the choir and presbytery were quarried from Bosoboso where twenty men were hired to cut and hew them. The remaining steps in the presybetery were paved with beautiful piedra china or Chinese granite which a generous patron donated. The cathedral organ was itself assigned to an expert organ maestro, who was the only one in the islands. A new cupola was built at the transept and nave crossing. The choir area was installed with iron grilles. The central nave was lined with railings to separate it from other areas. Hardwood flooring paved the lateral naves and rear areas. The windows with their stained glass were fixed with wire screens as a means to security. For the exterior, whitewash was applied all over. By 1758, the cathedral’s main body was complete with its interior vaultings, coffered ceilings, and paneled walls. Works in the cathedral were temporarily suspended until 1761, when a storm caused damages on the roof, forcing the archbishop to resume work in it. The British invasion in 1762 scarcely caused any damage in the cathedral structure. However, it was deprived of its many treasures when, under threat of death, Archbishop Rojo was forced by the British to hand over its collection of silver and jewels valued at 31,309 pesos. The structure, however, underwent repairs. Areas which were eaten by termites and other pests were repaired, and the cupola of the cathedral was given a new sheathing of lead in the shape of fish scales. All these works were supervised by Juan de Uguccioni. Since the Manila Cathedral was reconstructed by Uguccioni and inaugurated n 1760, there had been no significant major alterations or modifications in it, except for some minor repairs and regilding, until another major reconstruction in the middle of the 19tj century. In 1839, repairs were made in the cathedral. Commissioned to perform the repair works, particularly in the dome or cupola of the structure, was Don Francisco de Ojeda. Gilding was made in many areas, in the lamps within the church, the altar major and other auxiliary altars of the cathedral. Such repair and renovation works were supervised by the architect Don Jose Ygnacio de Barinaga. Master carpenter for the works was Don Gaspar Pabalan and the aparejador, or foreman, was Mariano Pabalan. In subsequent years, many repair works were made in the sacristy, roof, cupola, windows, and termite infested areas of the structure. On the night of September 16, 1852, an earthquake shook, damaged, and destroyed churches and other edifices in Manila, leaving the main façade and other areas of the cathedral in very severe condition. Upon the request of the Cathedral Chapter, the Arquitecto de Hacienda, Juan Mendoza y Grajales, conducted an inspection of the cathedral. In his report of October 6, 1852, Architect Mendoza cited that the cathedral definitely suffered major damage. Previously unsuspected cracks borne by earlier earthquakes and which before were unnoticeable manifested themselves in the principal nave. The front façade was likewise seriously damaged with its balance seriously affected and lost. Out of the six pear-like ornaments that crowned the façade, two were destroyed, and so much danger was posed by the deteriorated façade which had begun to crumble down.